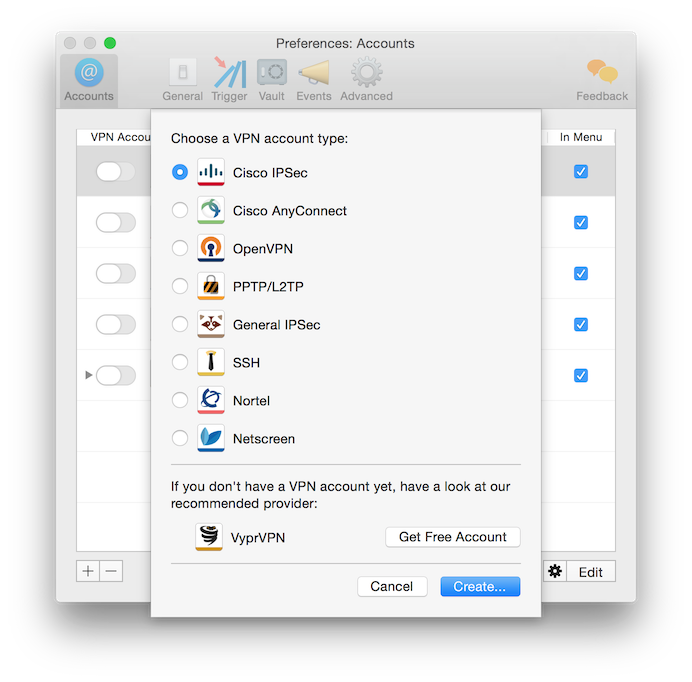 #1 VPN client for Mac – for Everyone. Cutting-edge technology ensures that your connections are secure and your data is safe. Shimo is based on the latest security technology available. Your privacy and the security of your data is protected when using Shimo to establish network connections. We make no compromises when it comes to security standards. Shimo provides encryption technology such as AES-256 which is even certified by governmental organizations, global enterprises and the military. But encryption is only as strong as its weakest link. As a consequence, our hash algorithms include SHA-2, the latest set of cryptographic hash functions. Additionally, secure cryptographic key exchange over insecure or public channels is enabled using the Diffie-Hellman (D-H) method. Likewise, passwords are often not sufficient to introduce security to a system. If your connection requires certificates or one-time passcode tokens, such as RSA SecurID, our VPN client for Mac provides the necessary toolset through Extended Authentication (XAUTH). Shimo is only one click away – from everywhere! There is no need for any additional window to have full control over your VPN connections. 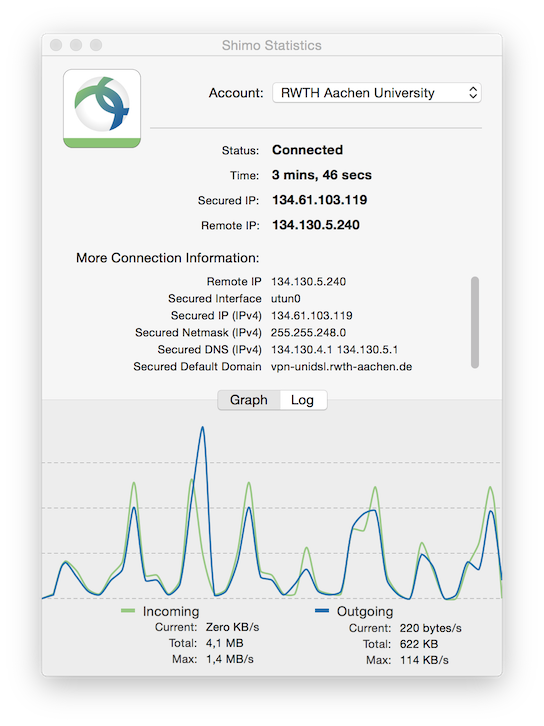 Shimo can easily be accessed over the menu bar of OS X: Connect and disconnect VPN connections, access statistics and accounting information, or notice the secured IP address of connected accounts. User Experience is one of the core values of our product design philosophy. Consequently, there are no complicated configuration dialogs or hardly comprehensible settings. Shimo – the most sophisticated VPN client for Mac – enables with its lean design access and control in a simple and easy way. There are no limitations regarding the use of VPN protocols. Shimo supports every major VPN protocol that is currently available: The widely used CiscoVPN, the very secure OpenVPN and all standard-compliant IPSec connections. It also handles Point-to-Point Tunneling (PPTP VPN) and Layer 2 Tunneling (L2TP) protocols. Even Cisco’s new Secure Socket Layer (SSL) protocol AnyConnect is supported by Shimo – the most flexible VPN client for Mac. Shimo also enables you to establish encrypted Secure Shell (SSH) connections including port forwarding for secure web browsing. 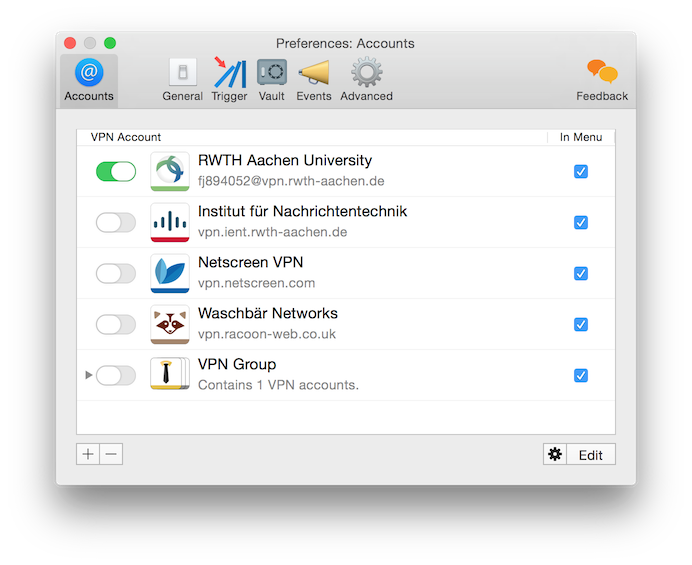 There is no other VPN client for Mac which supports this variety of available protocols. If you want to have the all-in-one solution for your secure connections, Shimo is technology of choice. This feature is not only helpful, if you have to handle different types of connections, but rather in cases where your system administrator upgrades or changes the used protocol. With Shimo you are always prepared and ready to go. Shimo enables you to establish multiple connections at the same time. With Shimo you are not restricted to one single VPN connection at a time. You can connect to multiple VPN endpoints simultaneously. Hence, Shimo is the favorite of power users and consultants. Complex network are easily manageable using Shimo – the number one VPN client for Mac – as it is possible to setup multiple connections using various protocols. Shimo provides features, such as account search and categorization into groups, to easily handle and organize a large number of VPN accounts at the same time. As passwords do not provide sufficient security anymore, Shimo supports modern two-factor authentication. Shimo stores all your account-related information in OS X password management system: The Keychain. This comprises your VPN credentials, such as passwords and PINs, as well as your certificates. The stored information is securely encrypted by your OS X user password. Shimo is further based on latest innovations in OS X security, such as code signing, 64 bit, XPC services and more. This guarantees high level security for your sensitive data. But especially the support of modern two-factor authentication methods, such as Tokens (e.g. RSA SecurID, Symantec VIP), keeps Shimo on the highest possible standard regarding data security. Thus, Shimo is the top choice when looking for the most secure VPN client for Mac. With triggers you can make sure that your connection is always secured – Always. Secure VPN connections can only protect your data when they are established. To make sure that your network connection is secured whenever required, Shimo allows to automatically connect VPN accounts based on certain trigger conditions. With Shimo you can define triggers based on the computer’s network configuration, your geographic location, or the Wi-Fi network or its type of encryption. 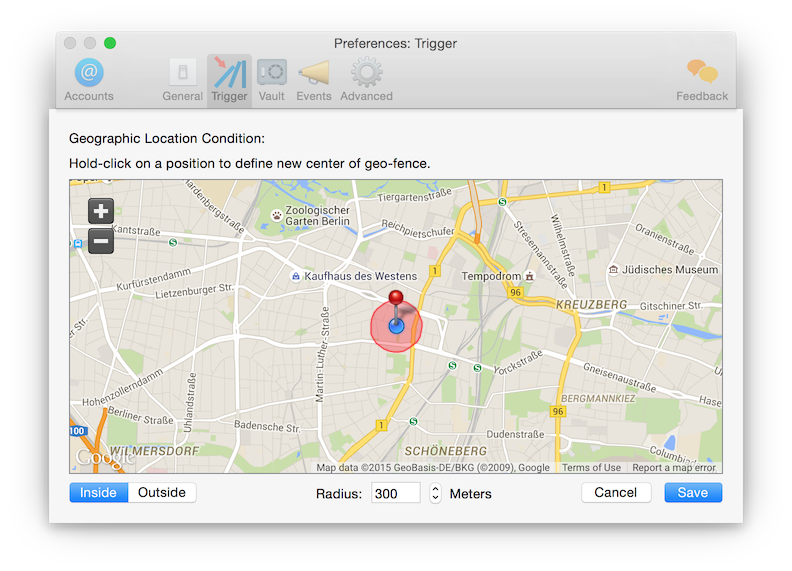 You can also configure triggers based on launch or termination of other applications. It even allows to use VPN connections themselves as triggers for other accounts for automatically establishing chained VPN connections. But you can also configure actions to be performed when a particular VPN connection is established or terminated. Connect to network servers, launch other applications or just check your company email for new mails – everything is possible with Shimo’s automation features. Shimo records information necessary for keeping track on billing data and displays live statistics for direct insight. Shimo is the perfect companion for consultants and business users. The integrated accounting feature takes care of detailed time-tracking, allowing to easily create informative overviews at the end of each billing cycle. The recorded data comprises a time stamp, the time duration, the IP address and the data traffic. It is even possible to add further comments for later reference. Additionally, a CSV export feature enables further processing of this accounting information in Numbers, Excel or other billing systems. Dynamic statistics are showing current data regarding active VPN connections. Hence, with only one view you can keep track on your VPN connection data in real time. Shimo – Professional VPN Client for Mac. IT admins love Shimo for its features to import, export and to deploy accounts and configurations. Shimo is easily deployed within businesses or to customers. Pre-configured accounts, including all required credentials, certificates, etc. can be provided by simply exporting particular VPN connections. As an IT administrator you can create deployment packages using Shimo which include everything required for your VPN users to get started immediately: VPN configurations, associated auxiliary files, potential scripts and even Shimo’s user settings. Deployed account configurations can even be defined read-only to prohibit that your clients might tamper with any of the VPN settings. 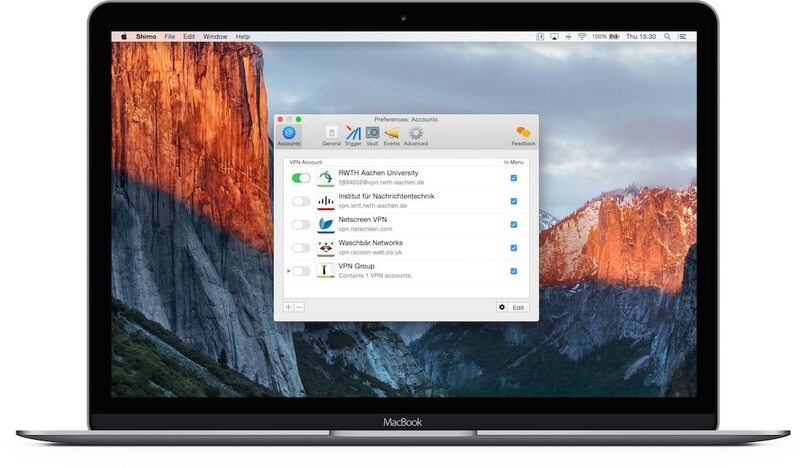 Shimo is the perfect VPN client for Mac admins.